Thule Insta-Gater Truck Bed Bike Rack , Truck & Car Racks from Proline: Thule Racks, Yakima Ski Racks, Bike Racks Canoe and Kayak Racks Cargo Carriers and Truck accessories. 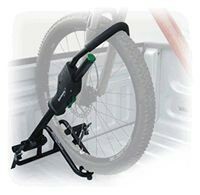 Thule 501 Insta-Gater pickup truck fork mounted bicycle racks. The Instagater holds 1 bike.